I love a good Jasmine Tea … and this Organic Jasmine Pearl Scented Green Tea from Teahouse Kuan Yin is definitely a good Jasmine Tea! First of all – I LOVE that it’s organic! I love that it’s a scented Jasmine. A few days ago, I had a dreadful encounter with a Jasmine tea that was not scented but instead flavored … and there is a difference! I know I’ve talked about the difference here on this blog before, but for those of you who haven’t read my rant about the difference: basically, a scented jasmine is a tea that has been properly jasmine-ified (yes, it’s a word, I just made it up) … that is to say, the jasmine scent/flavor was achieved by layering the tea leaves with fresh jasmine blossoms, allowing their heady essence to absorb into the leaves naturally. A flavored jasmine, on the other hand, is a tea that has been flavored/scented with a jasmine oil. The result of this process creates a tea that tastes more like perfume than like tea. And it’s just plain nasty. But this Organic Jasmine Pearl Scented Green Tea from Teahouse Kuan Tin was NOT flavored … it was scented! The leaves were layered with the jasmine flowers! That’s the way to do it! The result is a tea that is pleasantly flavored with the natural essence of jasmine and not a perfume-y substitute. It is beautifully floral. 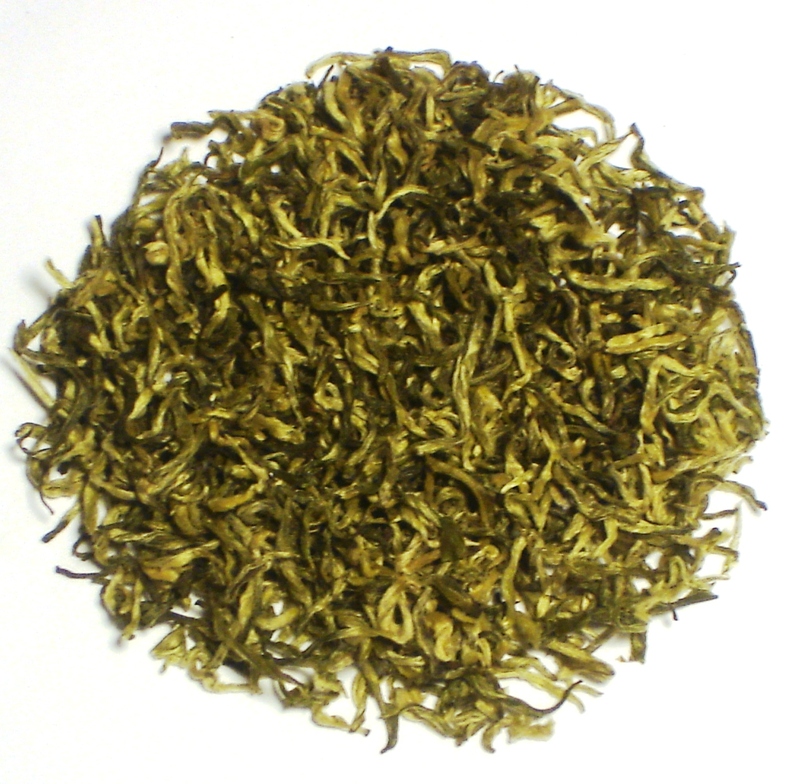 The green tea tastes lightly vegetative, and melds beautifully with the floral notes. A lovely, contemplative cup. If you like a good jasmine tea … this is one you should try. Considered to be one of China’s ten famous teas, our Bi Lo Chun (Green Snail Spring) produces a fragrant, nutty brew which is lightly astringent but mellow. There is a refreshing sweetness to it, with a slightly buttery finish. This tea is from Fujian Province. It is very sensitive to brewing times and temperature, so we recommend infusing it with relatively cool water (~160F) for only 2 minutes. Bi Lo Chun literally means “Green Snail Spring.” The “snail” is because the leaves are rolled into spirals resembling snails, and “spring” is because it is picked in the early spring, when the buds and young leaves are still small and delicate. There can be 7,000 buds in just one pound of Bi Lo Chun. This tea is so good. It is so good that it is almost difficult to write about it because I feel like mere words do not do it justice. It has a toasted nutty quality and a floral presence. It is sweet and smooth, and has a very pleasant buttery note. The company describes it as lightly astringent… and I would like to state that the astringency is very mild. This is a lovely tea that is very relaxing and luxurious to sip. I think it should be consumed hot (well, warm, since you should brew it at a fairly low temperature) and unsweetened. And the leaves are good for multiple infusions – making it an excellent value in exquisite taste! Prepare yourself. This tea is delightful… delicious… perfection!